This year marks the 50th anniversary of the assassination of Dr Hendrik Verwoerd by Dimitri Tsafendas. Originally released in 1980, Henry Kenney’s incisive study of the architect of apartheid and paragon of Afrikaner nationalism will be republished in 2016 to coincide with this significant moment in South Africa’s modern history. 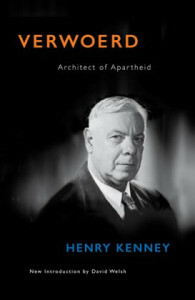 In Verwoerd: Architect of Apartheid, Kenney interprets Verwoerd in the context of the Prime Minister’s times and his own present, explaining the man and assessing his role in shaping South Africa’s history. He examines the rationale behind the policy of apartheid and, after more than a decade since Verwoerd’s assassination, he is able to distance himself from his subject and offer a balanced and objective insight into the workings of the apartheid system. What results is a fascinating study of a man who identified obsessively with the Afrikaner people, while aware that his foreign birth set him apart. The new edition contains an introduction by David Welsh, Emeritus Professor at Stellenbosch University, bringing it into the 21st century and updating it for a new generation.